While the existence of aliens and UFOs is still a debatable subject, many people claim of have witnessed these. 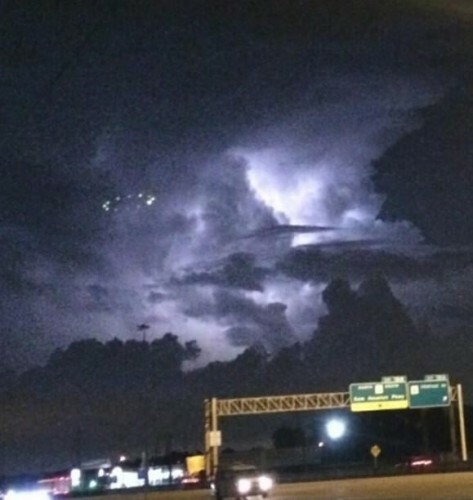 Lately, Twitter is abuzz with pictures of an apparent UFO hovering over the US city of Houston during a stormy night. The images, shot on 11 August, show a circular object with blinking lights floating over Houston sky during a rain storm. The dramatic pictures appear nothing short of a Hollywood thriller, as in one image, the object appears to be protruding from the thunderous clouds and in another, the oval object appears to stand on its side with an impressive light show, KPRC News reported. “I think the trick in UFO’s is figuring out what else they could be. It’s easy to say that could be the aliens,” Dr. Carolyn Sumners of the Houston Museum of Natural Science told KPRC News. Sumners didn’t deny the possibility of an unidentified flying object but said more investigation is needed to figure out the real identity of the object. “If it’s a real object and it looks like it is. The more people who see it in different directions, the more likely we are to figure out where it is, what it is and see if we can explain it. “All the way back to recorded history, there are going to be things we can’t explain. That’s what makes it exciting,” she added. The incident has the locals talking about the unusual extraterrestrial phenomena and many has turned up to Twitter to express their amusement.